ანგარიში მომზადდა „ციხის საერთაშორისო რეფორმის“ პროექტის „საქართველოს სისხლის სამართლის სისტემაში გენდერ-სპეციფიკური საჭიროებების ადვოკატირება ქალთა უფლებების გაუმჯობესებისათვის“ ფარგლებში, ფონდი „ღია საზოგადოება – საქართველოს“ (OSGF) ფინანსური მხარდაჭერით. კვლევის ანგარიშში ასახულია საქართველოს სისხლის სამართლის პოლიტიკის გენდერული ასპექტებისა და შესაბამისი საკანონმდებლო აქტების, რეგულაციებისა და პრაქტიკის ანალიზი. 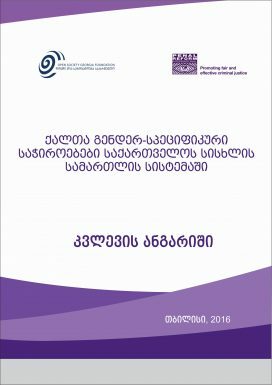 The research was commissioned by PRI South Caucasus Regional Office and conducted by a local researcher, Anton Kelbakiani, with the assistance from Natalia Tsagareli, and in cooperation with an international human rights consultant, Joanne Baker. The research was carried out between March and June of 2016 and covers the period of 2013-2015. The report text also includes some updated information.